You are currently browsing the archives for the Larry Haws category. St. Cloud lost a giant in the history of the city when Larry Haws passed away Tuesday. He was 72. During his short time in the state legislature, Larry was the workhorse who got things done. Tarryl Clark had the higher profile but Larry’s the one who got the work done. Larry was in his first full term in the House when he submitted a lengthy list of items for that year’s bonding bill. Unlike other legislators, though, Larry’s projects were mostly maintenance items of state buildings, something clearly within the state’s list of responsibilities. I had a pair of tussles with Larry but it was impossible to not respect his commitment to serving St. Cloud. He was an educator, a sports coach, the leader of St. Cloud’s Park & Recreation Department. Larry even sat in for conservative talk show host Dan Ochsner occasionally. That’s just who Larry was. My prayers & sympathies go out to Larry’s family. I can only imagine the pain they’re going through. AFter all, it isn’t easy losing a giant. This morning, I received a letter from the State Commander of the American Legion that recognizes the legislature has openly and publicly defended our stance to hold veterans and the Department of Military Affairs harmless in our budget. The State Commander correctly recognized that the honorable men and women that serve in our armed forces have been a top priority with both the Senate and House for the entirety of this session. The rhetoric being used by your administration completely disregards the legislature’s intent to provide the funding necessary to provide care to our veterans in our state’s veterans homes, to assist veterans in securing federal benefits and to maintain the readiness of our national guard. At the first hint of discretionary authority, you directed your staff to cut veterans and military affairs. I grew up in a military household. I served eight years in the National Guard. I have been around the military and veterans my whole life and I know what leadership looks like. What you have done to the military and veterans community is not leadership. The sound you hear is Gov. Dayton’s facade of nonpartisanship shattering. The State Commander of the American Legion isn’t an honorary title given to someone for being a swell guy. They’re picked because it’s known that they’ll be the veterans’ fiercest advocate. Furthermore, the American Legion isn’t a partisan organization. They’ve shown their appreciation for those legislators who’ve been the veterans’ staunchest allies, regardless of political affiliation. Testiment to that principle is the praise Republican Dan Severson and Democrat Larry Haws received in 2007 for their work on the veterans bill. When General/Commissioner Shellito said that “the legislature shouldn’t balance the budget on the backs of the veterans”, he ignited a firestorm, a firestorm that’s been intensifying since. MMB Commissioner Showalter has been at the heart of this administration’s attack on the truth. He’s insisted that his numbers are right even though the plain language of the House and Senate bills have mocked him. CHAIRMAN PARRY: General, I do admire your position. I do know that you are a soldier. And I know that when soldiers are given orders, they carry them out to the fullest and I admire you for doing that. My concern is, for all in here who are veterans, it’s time that this administration quits using veterans as a political pawn. I don’t think I have to say anymore. Stop it. REP. DOWNEY: I’m looking at the House bill and maybe there’s some things in the Senate bill, and I know that the Commissioner has said that they’ve done some extrapolations and assumptions that revenues that they couldn’t realize so I appreciate them working off a different number but I’m looking at the House bill and we are expecting that the executive branch agencies would generate $94,875,000 in additional reductions that aren’t already factored into our other omnibus finance bills and yet you’re talking about a $90,000,000 reduction and yet we’ve just heard that from the Department of Veterans Affairs that $10,000,000 in reductions so we’re already exceeding the target so we’re talking about two of our relatively smallest agencies so we haven’t talked with Health and Human Services or the big monsters. So, members, I just want to pull us back to the fact that these commissioners are relying on information that appears to be largely politically motivated, to somehow extrapolate from these bills to proscribe none of the things that are being communicated here. Nowhere in this bill is there a $90,000,000 reduction so if you’re getting your information from MMB or admin or wherever it comes from or the executive branch, I’m not sure how valuable this hearing is, Mr. Chair, if every single number is being presented and all of the draconian outcomes that are being represented aren’t even close to the provisions in this bill. And if we’re going to continue with the hearing, I would like the testifiers to say that, upon the governor’s instruction, and direction from the office of management and budget, that we are going to make these cuts, that these are the Governor’s prerogatives or his priorities and not ours because they are nowhere’s in our bill. And we can continue to sit here and have the discussion with Mr. Showalter about how they were trying to come up with calculations and derrivations from our bill to support these numbers but members, I’m starting to tire of the discussions and having to constantly come back to the fact that it’s not our bill that’s driving these numbers, that it’s the Governor’s priorities. I was stunned at how Commissioner Showalter tried manipulating the bills’ language. Time after time, Republicans exposed him as taking partisan positions. Time after time, Commissioner Showalter spoke about worst case scenarios that weren’t in the bill. In one instance, Commissioner Showalter hinted that the workforce reductions that would happen if Keith Downey’s 15 by 15 bill passed would all happen in the first year of the legislation being enacted. There’s a reason why the legislation is called 15 by 15. It requires a 15 percent reduction in the state workforce by 2015. The last I looked, 2015 is more than 12 months away. Commissioners Showalter and Shellito got exposed as partisans working for Gov. Dayton’s political agenda. When Commissioner Shellito said that “the legislature shouldn’t balance the budget on the backs of the military”, he crossed a bright, unmistakeable line. Between the two of them, they said things that forced the American Legion into the fight. Like I said earlier, politicians picking fights with the American Legion leads to predictable outcomes. That outcome won’t be good for partisan politicians. The row started last week after Veterans Affairs Commissioner Larry Shellito said in a Star Tribune article that the lack of specificity in the Republican budgets could have unwanted consequences, including the closure of a veterans home and higher burial fees for veterans. Republicans held a press conference Friday, saying Dayton and his administration were misleading the state and using veterans as political pawns. They maintained that they have preserved funding for veterans in their budget bills. Dayton officials called the meeting today to respond. Afterward, Lanning described the meeting as more of a lecture and walked away. Parry returned to speak to the press, and said he had hoped to keep emotions out of the budget negotiations. He admitted, however, that Dayton seemed primarily upset by a letter the committee chair sent him earlier on Monday. In the letter, Parry questioned Dayton’s leadership style. Gov. Dayton apparently didn’t like getting exposed as playing political games with military bills. Gov. Dayton’s temper tantrum that Chairman Lanning spoke to isn’t surprising considering the type of life of privilege Gov. Dayton has led. I can’t imagine he’s dealt with that type of harsh criticism that often in his life. When he was a senator, Gov. Dayton got criticized by Republicans but the Strib and other media allies kept saying nice things about him. Also, he never got important enough to sit on a conference committee, much less chair one. Now he’s the guy and his administration is getting criticized by the American Legion for using veterans as political pawns. I can’t imagine Gov. Dayton taking that well. Reforms or Beating up on the Middle Class? “Reform without revenue is just another excuse for Republicans to beat up on hard working Minnesotans and take credit for work that’s already been done. In 2008, the DFL spearheaded ground-breaking health care reforms that saved Minnesotans millions of dollars. Republicans loudly denounced the change. In 2009, the DFL again passed massive public employee pension reforms that increased employee contributions and reduced benefits. After just 10 months, these reforms have already saved the state $6 billion in pension costs. Again, pension reform passed despite Republican opposition. In fact, the reform that Representative Mack is now touting to modernize and streamline computer systems, as well as simplify applications, was proposed by the DFL and progress has already been made in this area. The DFL also took the lead on combating fraud in the last 2 years. Reforms initiated and passed by the DFL saved nearly a half million dollars by providing additional enforcement. Republicans must soon face the reality that “reform” is easy to say, but implementing it is hard work and often requires an up-front investment. For example, modernizing DHS’s computer systems as Rep. Mack suggests could cost approximately $500 million to the HHS budget, a budget that is already being cut by $1.6 billion in the GOP proposal. Worse than the unfunded Mack proposals, the GOP is packaging an assault on middle class families and workers as ‘reform.’ Slashing thousands of jobs and moving people to unemployment rolls is not reform. Breaking promises to hard working Minnesotans and undermining the fabric of broad prosperity is not reform. Turning Minnesota into Wisconsin or worse is not reform. The House DFL Caucus has been and will continue to be committed to real reforms that benefit Minnesotans. Because of our leadership, Minnesota has one of the leanest, most efficient, and effective governments in the nation. Rep. Thissen’s missive notwithstanding, the reality is that the DFL’s reforms mostly amounted to throwing lots of money at things while not changing policies. Their special interest group allies wouldn’t let them make serious reforms because government reforms would take money out of their pockets. WI and PA have both employed HHS integrated eligibility websites; these sites make the process easier for users and more efficient for agencies involved—reducing costs and improving results on both sides. The DFL’s alleged reforms in 2008 certainly didn’t prevent the monstrous $6.4 billion deficit of 2009. In fact, most of the DFL’s reforms weren’t really reforms. Prior to the 2008 session, Tarryl Clark, Larry Haws and Steve Gottwalt participated in a League of Women Voters Education Forum at the St. Cloud Council Chambers. The DFL’s focus on reform was evidenced by Tarryl’s insistance that K-12 needed more money. Let’s remember that the first 6 bills in the 2007 Senate hopper included tax increases. That’s at a time when we had a $2,163,000,000 surplus. Reformers don’t start with tax increases when we’re running a multi-billion dollar surplus. Rep. Thissen’s reform statement rings hollow. Reformists don’t start with 6 major tax increase bills. Reformists don’t get startled by the prospect of setting priorities, either. I’d further add that there’s nothing in the GOP’s reform agenda that constitutes “an assault on middle class families and workers.” That’s nothing more than typical DFL class warfare tactics. RT @epmurphy: Former Gov. left @GovMarkDayton a mess. Actually, the DFL legislature produced one balanced budget that the media treated like a joke. When the media treats a DFL budget like it’s a joke, you know it’s noteworthy. The DFL hasn’t presented a serious budget in at least 6 years, possibly longer. In 2007, when they took over the House, there was a $2,163,000,000 surplus. By the time the 2008 election rolled around, that surplus had essentially disappeared. This is instructive for multiple reasons. First, the situation Minnesota was faced with was that of a significant surplus and a slowing economy. That’s the worst combination imaginable if you aren’t paying attention. With that big a surplus, it isn’t difficult to get complacent. That’s obviously what happened with Rep. Haws. Rep. Gottwalt had talked about the slowing economy and had urged restraint during the previous spring’s budget negotiations. He wasn’t alarmist. He was just exercising justified caution. By the time 2009 rolled around, Minnesota faced “a $6.4 billion deficit”, a fact Rep. Buesgens reminded people of almost daily. Despite the reminders, the DFL submitted one balanced budget the entire session. That budget came with less than 10 minutes left in the session. Two months into the biennium, the budget was in deficit. That’s how big a joke the DFL’s 2009 budget was. In a $33,000,000,000 budget, MMB projected a surplus at the end of the biennium of less than $35,000. Does that sound like a legislator who views himself as the taxpayers’ watchdog? Or does it sound like someone who’s intent on spending like a drunken sailor? That the DFL has the audacity to be that reckless with spending is terrifying enough. That they’d then accuse Gov. Pawlenty of ruining the state is proof that the DFL isn’t in touch with reality. 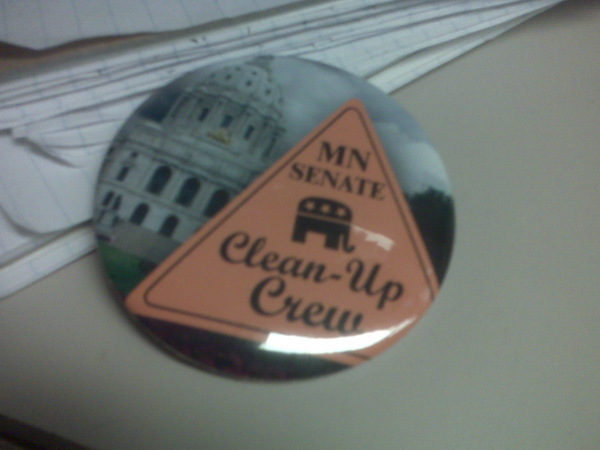 Thank God Minnesota had the sense to elect GOP majorities in the House and Senate to be the taxpayers’ clean-up crew. Friday night, former state Rep. Karla Bigham was part of Almanac’s political roundtable with Denise Cardinal representing the DFL and Jen DeJournett and Gregg Peppin representing the MNGOP. Suffice it to say that this wasn’t Bigham’s shining moment. First, she never got beyond the DFL’s talking points. There didn’t appear to be any original thought involved in her answers. The other thing that made this a less-than-stellar performance was her consistent insistence that Gov. Pawlenty drove up property taxes by not raising income taxes. This must be a great gig for DFL mayors. They get to spend foolishly, then have pundits like Rep. Bigham blame their misspending on Republicans. It’s better than no-fault insurance. R.T. Rybak and especially Chris Coleman spend money they don’t have on things they don’t need. They don’t have to set spending priorities or say no, either, because the Karla Bighams of the world will blame Gov. Pawlenty for the spending mess in St. Paul and Minneapolis. That doesn’t sound like someone who’s accustomed to setting priorities, does it? In fact, that sounds like someone who thinks of setting priorities as a foreign concept. Local property taxes are determined by how big the city’s wish list is and how much of that wish list is included in the budget. By saying that their messes are Gov. Pawlenty’s fault is exempting mayors, city councils and county commissioners from responsibility for their decisions. Let’s phrase this differently. If R.T. Rybak or Chris Coleman and that city’s city council decide to spend money, what authority does Minnesota’s governor have in preventing the spending of that money on that item? The only role Minnesota’s governor has in that city’s budget is whether he vetoes legislation that will subsidize that city’s spending decisions. Either way, the mayor and city council are responsible for their spending decisions. They can choose to not spend the money, spend money on something but not as much as that department had hoped for or they can vote to spend money on a project but only after they reform how that agency or department delivers that service. Denise Cardinal stuck to the DFL script, too, though she didn’t say anything as outlandish and provably false as Rep. Bigham said. If Bigham and Cardinal are the best spokespeople for the DFL, they’ve got some difficulties with independents. Jen DeJournett and Gregg Peppin did a solid job of explaining the GOP agenda. When talking about the high priority bills that were introduced this week, DeJournett and Peppin did a nice job of explaining how that legislation would make Minnesota more business friendly. Retired state representative Larry Haws is recovering after brain surgery at St. Cloud Hospital. Doctors on Tuesday removed a large tumor, said Haws’ wife, Faith. Haws, who retired Jan. 1 after a long career in Stearns County and state government, is recovering in the intensive care unit, she said. A biopsy of the tumor is expected back Friday, she said. Haws will need radiation regardless, she said. It isn’t a secret that I’ve disagreed with Larry more than once. It shouldn’t be a surprise, though, that I wish Larry a speedy and full recovery or that I’ll keep Larry, Faith and their family in my prayers until Larry’s back to being his usual smiling self. Now that the filing date for the Minnesota state legislatures has passed, it’s time to size things up in central Minnesota. Until Tuesday, not only weren’t Republicans sure if popular incumbents like Steve Gottwalt, Mary Kiffmeyer and Michelle Fischbach would have challengers. It’s that we weren’t certain that the DFL would have a challenger for the open seat left by Dan Severson’s decision to run for the Secretary of State job instead. Republicans have a strong group of candidates for central Minnesota. King Banaian is running for the open seat in HD-15B created by Larry Haws’s surprise retirement. He’ll face either former school board member Carol Lewis or former Franken organizer Zachary Dorholt, the winner to be determined by an August primary. Local businessman Tom Ellenbecker will face off against House assistant Majority Leader Larry Hosch. This is my bellwether race. If Ellenbecker defeats Rep. Hosch, then there’s a strong chance that Kurt Zellers will be the next Speaker in the House of Representatives. The HD-16A matchup is a rematch of the 2008 election, pitting current DFL incumbent Gail Kulick Jackson against Sondra Erickson. Jackson defeated Erickson by 99 votes in 2008. Now Jackson has to defend her record. This will likely be another tight race. If the tide is big enough, Rep. Kulick-Jackson will have an uphilll fight getting re-elected. In the end, the DFL talked Rob Jacobs to run against Sartell Mayor Tim O’Driscoll for the HD-14A seat currently held by Rep. Dan Severson. The fact that Jacobs filed on the last filing day suggests that he isn’t motivated this year. At any rate, he’s trailing badly in fundraising, organization strength and name recognition. Further north, DFL incumbent Al Doty faces an uphill fight against Mike LeMieur in a rematch from 2008. LeMieur is currently the Little Falls City Council President. Doty won by only 76 votes in 2008 in a strong DFL year. The same headwinds that carried Doty to victory have since been replaced by a strong tailwind at LeMieur’s back. Further west, Mary Ellen Ottremba’s surprise retirement makes it difficult for the DFL to hold that seat. Mary Franson is the GOP-endorsed candidate. With this being a conservative district, I rate this seat as leans Republican. Republicans had an outstanding year recruiting House and Senate candidates. Matt Dean and Amy Koch should be applauded for the job they did and the candidates they recruited. In my opinion, the House is definitely in play for the GOP. While it’s a steeper climb for Republicans in the Senate, there’s no question but that the veto-proof DFL Senate is history. It’s impossible to know how it all shakes out this far out but the DFL must be worried. Make no mistake about it: the DFL is scrambling in Central Minnesota. This was only highlighted by Rep. Larry Haws’s surprise retirement announcement Sunday night. The DFL currently doesn’t have a candidate in House Districts 14A, 15A and in SD-14. They were without a candidate in HD-15B less than 24 hours because Carol Lewis announced that she was running for Rep. Haws’s open seat. One DFLer wasted no time stepping forward: Former St. Cloud school board member Carol Lewis said Monday she hopes to replace Haws in House District 15B, which covers north, east and downtown St. Cloud. Lewis ran for the District 15B seat in 2005, but dropped out after losing the DFL endorsement battle to Haws. If elected this time, Lewis says sheâ€™d focus on â€œfiscal responsibility.â€ That could come through combining state agencies to cut costs, and also may require expanding the state sales tax to cover clothing, Lewis said. Raising taxes of any sort won’t be popular this election cycle. Ms. Lewis will get a cold reception from voters once it’s known that she wants to raise taxes when families are struggling. Larry Hosch will have a real fight in HD-14B. He’s being challenged by small businessman and longtime GOP activist Tom Ellenbecker. Mr. Ellenbecker is helped by the fact that Rep. Hosch didn’t follow through on reforming the Green Acres tax laws like he promised. Politicians break campaign promises all the time and get away with it. This is one of those promises that people expected to be kept. Because the DFL legislature didn’t fix the mess they created in 2008, farmers’ property taxes will be significantly higher, putting many farms in distress. Rep. Hosch won’t get those farmers’ support when he visits their farms this summer. Hosch will find it difficult to win without substantial support from his district’s farmers. Adding to Rep. Hosch’s difficulties are his frequent votes for tax increases the past 2 years as part of the House DFL leadership. That won’t play well in 14B because it’s one of the most conservative districts in the state. It isn’t currently represented by a conservative because, prior to this election, Rep. Hosch was able to portray himself as a centrist/moderate. That won’t be possible this cycle because of all the tax increases he voted for this session. Republicans are willing to work hard this cycle. Add to that that they’re on the right side of the issues in most polling and the DFL’s disarray and you’ve potentially got the recipe for a strong year in 2010. Citing health issues within his family, Larry Haws announced tonight that he was retiring from the Minnesota legislature. I’d heard rumors that he might retire amonth ago but didn’t put much stock in them because Rep. Haws had already gotten the DFL endorsement to run for re-election in HD-15B. I thought it unnlikely that an endorsed candidate would retire. Considering the fact that there’s some health issues within Rep. Haws’ family, it makes more sense now. The conventional wisdom will have us believe that Rep. Haws’s retirement makes it more likely that King Banaian will get elected. there’s a certain amount of truth to that but it’s equally true that this was shaping up to be a challenging race for him. The biggest thing going for King is his understanding of building and sustaining a prosperous economy. Not so coincidentally, that’s this campaign’s hottest issue. Because youâ€™re a friend and supporter, I wanted you to know first about my decision to not seek re-election. Five years ago I offered myself as a candidate for public office in Minnesota out of a deep sense of appreciation of the issues important to the people of District 15B. As a Minnesota State Representative, I have gained the greatest respect for the people in our community and have enjoyed serving their diverse interests at the Capitol. It has been a great honor to help make policies to improve the quality of life for those Minnesotans who call St. Cloud home. During my service as your State Representative I have chief authored over 100 bills during five sessions and successfully carried and passed 15 bonding bills for Central Minnesotaâ€™s universities, prisons, airport, North Star Rail and the Civic Center. â€¢ I carried legislation important to the Minnesota Trust for Public Land that better positioned Greater Minnesotaâ€™s regional park system. As a past Park Director for the city of St. Cloud, I recognized the need to advocate a higher priority for the regional park system in rural Minnesota. â€¢ The Minnesota VFW applauded my efforts to carry the Governorâ€™s 2007 bill that was a cluster of 12 bills to address the needs and rights of Minnesotaâ€™s veterans. This legislation represents one of the most significant movements in veteransâ€™ benefits. â€¢ The Minnesota Work Force Council of Minnesota celebrated my authorship of legislation that required prioritization, reduction and saving of a work force program for at-risk youth in the State of Minnesota. Both the Minnesota Work Force Council and the Boys & Girls club benefited from this legislation. Before coming to the capitol, my life revolved around teaching and coaching, leading athletes in four different sports to win 14 state and national titles before I started to change my hat in to serve as the St. Cloud Park Director, and later, a Stearns County Commissioner. While at the St. Cloud Park Department, I established one of the earliest Adopt Park Programs, recruiting 2,000 volunteers a year and raising $8.3 million dollars to supplement the St. Cloud Park Budget. As a county commissioner I helped establish a public forum at the beginning of each commissioner meeting, invited television coverage of county meetings, and modernized the county web site. My priorities have always been my family and my community and will remain so whether Iâ€™m serving in public office or walking in the neighborhood. After 48 years of public service I am retiring one more time. I love retirement and have done so three other times. My professional journey has opened up incredible opportunities to engage with some wonderful people as we pursued common interests of concern to our families and communities. Iâ€™m not leaving St. Cloud; Iâ€™m leaving St. Paul and coming home to St. Cloud. Iâ€™m truly looking forward to being home and seeing more of familiar faces and places. Thank you again for the privilege of serving this district for the last five years. It has truly been an honor and a joy to represent the people in our community. Though I’ve disagreed with Rep. Haws on policy a time or two or more, I appreciate the hard work that he did in trying to improve St. Cloud. I wish Rep. Haws nothing but the best in his retirement. I hope he enjoys himself immensely in his retirement.